Most people consider plantain (Plantago major) to be a weed but some call it an herb. I decided I’d better check out the difference. The definition of “herb” I found is that herbs are any plants with leaves, seeds or flowers that can be used for flavoring, food, medicine or perfume. That’s rather broad -- it sounds like any plant that isn’t poisonous could be called an herb. The generic online botanical definition is even more encompassing: “any seed-bearing plant that does not have a woody stem and dies down to the ground after flowering.” Since plants can be weeds in some context and not others (depending on if they are wanted or not), the perennial plant, plantain, certainly fits the description of both weed and herb. Just for clarification, you will see plantains in the grocery store. There is no relation between the plantain that is a member of the tropical banana family and the herb/weed plantain commonly found growing wild in the United States. At the risk of being redundant, like most of the weeds discussed on this site, plantain is native to Europe and was introduced to North America when the settlers came from Europe. It had been used medicinally for hundreds of years so they probably brought it intentionally, but now it is spread accidentally throughout the world because many crop and grain seeds contain plantain seeds from the weeds growing in the fields. Again, like most of the other weeds, it is edible and very nutritious, high in calcium and vitamins A, C, and K; 3½ ounces of plantain contain approximately the same amount of vitamin A as a large carrot. Young tender leaves can be eaten raw but the older, stringer leaves are tough and bitter and are better cooked. In fact, the strings in the leaves become so tough as the plant ages that they can even be used to make small cords, fishing line or sutures in survival situations. The seeds are also edible but very small. It would take a long time to gather any significant amount of seeds, but if a person had enough time and patience, plantain seeds could be ground and used for flour. Another use for plantain seeds or flower heads is as an additive to tea to sooth sore throats. Used for healing purposes through the centuries, chemical analysis now supports the folklore. Plantain is an astringent and has antibacterial and anti-inflammatory benefits, containing the anti-microbial agent, aucubin. Another chemical present in the plantain (allantoin) stimulates cell growth and hastens healing. As a medicinal herb, plantain is most often used as a poultice for wounds, stings, rashes and sores. One very simple way to use plantain is to make a tea from the leaves to use as a spray to ease the itch of mosquito bites or poison ivy rash. Or, if you are out in the woods and making the tea is not an option, you can just chew the leaves and put the masticated leaf “poultice” on the skin. Plantain tea with its astringent characteristic is useful to treat diarrhea and because it contains so many vitamins and nutrients, it not only treats the diarrhea but also helps replenish depleted nutrients caused by the diarrhea. Plantago major, broadleaf plantain, is the most familiar plantain in our area. It grows wherever heavy traffic has compacted the ground -- on paths or in sidewalk cracks, as well as meadows and pastures -- anywhere the soil has been disturbed. The picture in the header is from the space between the sidewalk and a busy street in St. Paul (Minnesota). The less common narrow leaf plantain Plantago lanceolata, on the other hand, prefers to grow in fields and meadows among other plants. Narrow leaf plantain has narrower leaves (obviously) but the same characteristic prominent veins. Some people grow ornamental plantains in their gardens. Perennials.com describes the “rubrifolia,” the red-leaved form as “Extremely easy, this is practically a grow-anywhere plant although leaf color will be best with some direct sun. Good deer resistance.” That description sounds suspiciously like a weed to me. (http://www.perennials.com/plants/plantago-major-rubrifolia.html). 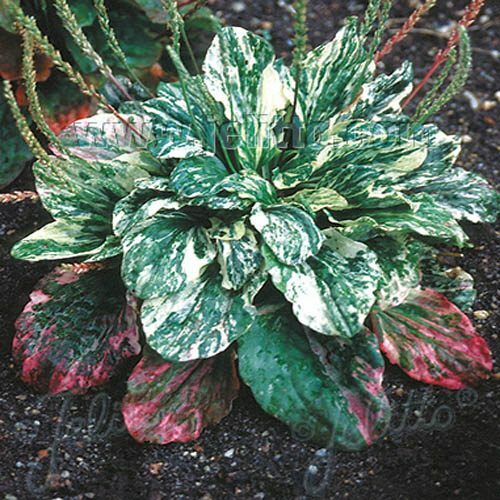 Outsiderpride.com sells variegated plantain seeds that look just like broadleaf plantains with variegated leaves. However, it gets a little confusing if you do a search for "variegated plantain." You will generally be directed to sites that sell “plantain lilies,” better known as hostas. Plantain seeds, dried leaves, oils, tinctures, salves, even lip balm are readily available on line (e.g. Mountain Rose Herbs, Horizon Herbs, Baker Creek Heirloom Seeds and, of course, Amazon). However with the easy availability of plantain you may want to try making your own concoctions for medicinal use. This recipe for skin irritations and bug bites comes from the Wellness Mama website (http://wellnessmama.com/3520/homemade-healing-salve/). Infuse the herbs in the olive oil. There are two ways to do this. You can either combine the herbs and the olive oil in a jar with an airtight lid and leave 3-4 weeks, shaking daily or else heat the herbs and olive oil over very low heat in a double boiler for 3 hours (low heat!) until the oil is very green. Pour into small tins or glass jars and use on bites, stings, cuts, poison ivy, diaper rash or other wounds as needed. Benvolio: …Take thou some new infection to thy eye and the rank poison of the old will die.